Hello and welcome to my Paperweight Photo Albums. 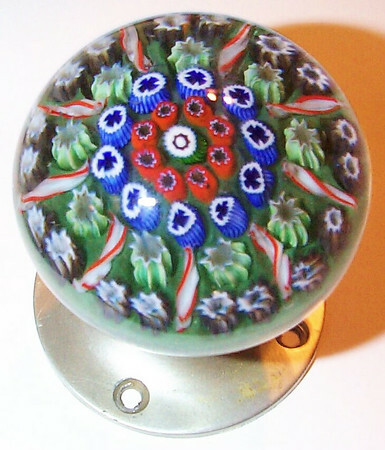 I suspect that I began collecting paperweights much as many others have, a bit of this and a bit of that but when I bought my first Strathearn I got caught up in the mystique of the Ysart Family influence on Scottish paperweights. Much has been written about Paul Ysart, his contributions and his paperweights and the history of the Ysart Family has also to date been pretty well documented but there's just not much available information on the Ysart Family paperweights from the 1946 to 1980 period covering Ysart Bros/Vasart and Strathearn, so I decided to concentrate my collecting to paperweights of this period. 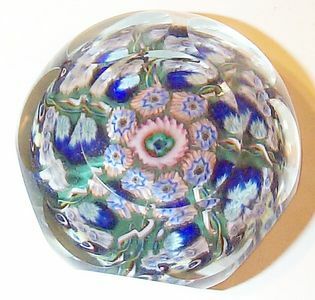 There is not very much historical information on the Ysart Bros/Vasart period paperweights covering the period of 1946 to 1964 available at this time, and there may never be, but a fair representation of many of their paperweights will be shown in my albums under the catagory of Ysart/Vasart. 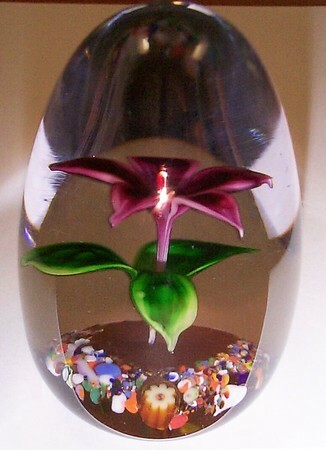 From what I've discovered over the last five years the Ysart/Vasart period did not include a large variety of paperweights and paperweight related glassware but Strathearn on the other hand had a quite large and diverse variety of paperweights and paperweight related glassware. I have identified 130 different paperweight catagories to date and there may be a few more to be found. The main collection of paperweight albums are set up in an alphabetical and "P" number sequence that Strathearn used and may have been designed from a Vasart system. The alphabetical listings are so listed because I have no idea what Strathearn's codes were for these items and some may never have had any codes, the "P" number albums start with Strathearn's first P-1 paperweight number (for their paperweight called "Ice Pool") and continues upward covering their paperweight designations up to 1980. 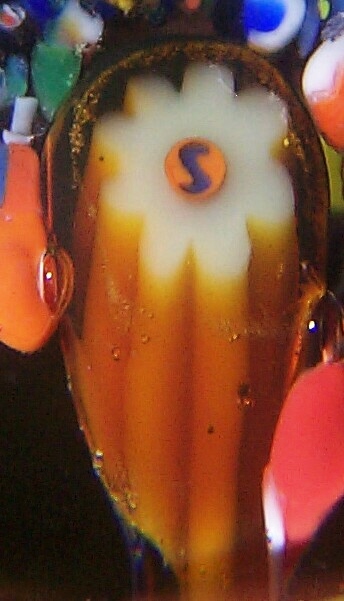 It is interesting to note that with some weights the initial "P" number was expanded to other editions of this same paperweight, for example the P1 Ice Pool had a 2nd series weight designated PSF12 where the "2" digit represents the second weight in this series or a faceted Ice Pool usually with a top facet and five side facets...then there was a 3rd series designated PSMF123 where the "3" digit represents the third weight in this series and this PSMF123 Ice Pool weight was multi-faceted on all sides. Actually, as I complete my gallery albums you'll see that Strathearn had quite a number of multiple series of their paperweights. Each album will have a general description of the items in this album and any other information I have accumulated like years of production, possible quanities, dates and signature canes, limited editions and so on but as you will see as you view the individual albums Strathearn did not strictly adhere to their description or schedules for a number of their paperweights so it is not unusual to find that where the Strathearn brochures indicate that a particular weight series was made in only a couple of colors in actuality it was made in more colors than indicated or where a particular paperweight series was all supposed to be signed, dated and numbered when in fact many of these series were not. 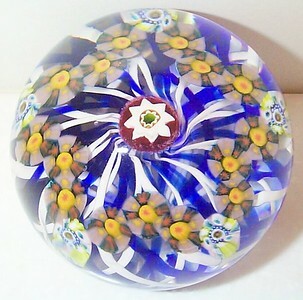 Each paperweight will have additional information particular to that paperweight or paperweight related glassware. My secondary albums will cover just primarily the signed and dated Strathearn paperweights and the individual variety of signature and date canes that Strathearn used from 1965 to 1980. You will probably notice a number of listed albums that have no photos in them...this is because I don't have an example of that paperweight yet. It is also interesting to note that Strathearn sized their weights in Minature, Small, Large and Jumbo sizes. There was no specific designation for Magnum sized weights although there are a number of Strathearn weights that easily qualify as being of Magnum size at 3.2" or larger (note: the generally used size for Magnum weights is over 3" but many of Strathearn's paperweights like the large cartwheel or spoke weights can easily be found at slightly over 3" so I've just drawn an arbitrary line as a weight being larger than 3.2" is a Magnum and over 4" is a Super Magnum other than those weights designated as being Jumbo sized.) The Minature weights are those from about 1.3" to 2.2" such as the P9, P13, P16 and P23. The Small weight catagory I've expanded to also include Medium weights since we easily find Spoke weights (and many others) ranging in size from just over 2.0" to over 3.0" so Small weights fall into the sizes from 2.2"+ to about 2.45" and Medium sizes from 2.45"+ to about 2.7" such as the P8, P12, P15 and P22 and Large weights fall into the 2.7"+ to about 3.2" such as the P7, P11, P14, and P21 and those larger being classified as Magnums such as the D4.